The reactor was assembled in November 1942, by a team that included Fermi, Leo Szilard (who had previously formulated an idea for non-fission chain reaction), Leona Woods, Herbert L. Anderson, Walter Zinn, Martin D. Whitaker, and George Weil. Because the enrichment of uranium had not yet begun at the Oak Ridge site, the reactor used natural uranium rather than uranium enriched in isotope 235. This required a very large amount of material in order to reach criticality, along with graphite used as a neutron moderator. The reactor contained 45,000 ultra-pure graphite blocks weighing 360 tons, and was fueled by 5.4 tons of uranium metal and 45 tons of uranium oxide. Unlike most subsequent nuclear reactors, it had no radiation shielding or cooling system as it operated at very low power – about one-half watt. The success of the reactor provided the first vivid demonstration of the feasibility of the military use of nuclear energy by the Allies, and the reality of the danger that Nazi Germany would succeed in producing nuclear weapons and win the war with them. Previously, estimates of critical masses had been crude calculations, leading to order-of-magnitude uncertainties about the size of a hypothetical bomb. The successful use of graphite as a moderator paved the way for progress in the Allied effort, whereas the German program languished partly because of the belief that scarce and expensive heavy water would have to be used for that purpose. In 1943, CP-1 was moved to Red Gate Woods, and reconfigured to become Chicago Pile-2 (CP-2). There, it was operated until 1954, when it was dismantled and buried. The stands at Stagg Field were demolished in August 1957; the site is now a National Historic Landmark and a Chicago Landmark. The idea of chemical chain reactions was first suggested in 1913 by the German chemist Max Bodenstein for a situation in which two molecules react to form not just the final reaction products, but also some unstable molecules which can further react with the original substances to cause more to react. The concept of a nuclear chain reaction was first hypothesized by the Hungarian scientist Leo Szilard on 12 September 1933. Szilard realized that if a nuclear reaction produced neutrons or dineutrons, which then caused further nuclear reactions, the process might be self-perpetuating. Szilard proposed using mixtures of lighter known isotopes which produced neutrons in copious amounts, and also entertained the possibility of using uranium as a fuel. He filed a patent for his idea of a simple nuclear reactor the following year. The discovery of nuclear fission by German chemists Otto Hahn and Fritz Strassmann in 1938, and its theoretical explanation (and naming) by their collaborators Lise Meitner and Otto Frisch, opened up the possibility of creating a nuclear chain reaction with uranium or indium, but initial experiments were unsuccessful. In order for a chain reaction to occur, fissioning uranium atoms had to emit additional neutrons to keep the reaction going. At Columbia University in New York, Italian physicist, Enrico Fermi, with Americans John Dunning, Herbert L. Anderson, Eugene T. Booth, G. Norris Glasoe, and Francis G. Slack conducted the first nuclear fission experiment in the United States on 25 January 1939. Subsequent work confirmed that fast neutrons were indeed produced by fission. Szilard obtained permission from the head of the Physics Department at Columbia, George B. Pegram, to use a laboratory for three months, and persuaded Walter Zinn to become his collaborator. They conducted a simple experiment on the seventh floor of Pupin Hall at Columbia, using a radium-beryllium source to bombard uranium with neutrons. They discovered significant neutron multiplication in natural uranium, proving that a chain reaction might be possible. Fermi and Szilard still believed that enormous quantities of uranium would be required for an atomic bomb, and therefore concentrated on producing a controlled chain reaction. Fermi urged Alfred O. C. Nier to separate uranium isotopes for determination of the fissile component, and, on 29 February 1940, Nier separated the first uranium-235 sample, which, after being mailed to Dunning at Columbia, was confirmed to be the isolated fissile material. When he was working in Rome, Fermi had discovered that collisions between neutrons and neutron moderators can slow the neutrons down, and thereby make them more likely to be captured by uranium nuclei, causing the uranium to fission. Szilard suggested to Fermi that they use carbon in the form of graphite as a moderator. As a back-up plan, he considered heavy water. This contained deuterium, which would not absorb neutrons like ordinary hydrogen, and was a better neutron moderator than carbon; but heavy water was expensive and difficult to produce, and several tons of it might be needed. Fermi estimated that a fissioning uranium nucleus produced 1.73 neutrons on average. It was enough, but a careful design was called for to minimize losses. (Today the average number of neutrons emitted per fissioning uranium-235 nucleus is known to be about 2.4). Szilard estimated he would need about 50 short tons (45 t) of graphite and 5 short tons (4.5 t) of uranium. In December 1940, Fermi and Szilard met with Herbert G. MacPherson and Victor C. Hamister at National Carbon to discuss the possible existence of impurities in graphite, and the procurement of graphite of a purity that had never been produced commercially. National Carbon, a chemical company, had taken the then unusual step of hiring MacPherson, a physicist, to research carbon arc lamps, a major commercial use for graphite at that time. Because of his work studying the spectroscopy of the carbon arc, MacPherson knew that the major relevant contaminant was boron, both because of its concentration and its affinity for absorbing neutrons, confirming a suspicion of Szilard's. More importantly, MacPherson and Hamister believed that techniques for producing graphite of a sufficient purity could be developed. Had Fermi and Szilard not consulted MacPherson and Hamister, they might have concluded, incorrectly, as the Germans did, that graphite was unsuitable for use as a neutron moderator. Szilard drafted a confidential letter to the President, Franklin D. Roosevelt, warning of a German nuclear weapon project, explaining the possibility of nuclear weapons, and encouraging the development of a program that could result in their creation. With the help of Eugene Wigner and Edward Teller, he approached his old friend and collaborator Albert Einstein in August 1939, and convinced him to sign the letter, lending his prestige to the proposal. The Einstein–Szilard letter resulted in the establishment of research into nuclear fission by the U.S. government. An Advisory Committee on Uranium was formed under Lyman J. Briggs, a scientist and the director of the National Bureau of Standards. 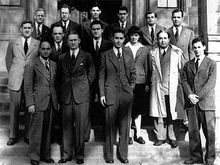 Its first meeting on 21 October 1939 was attended by Szilard, Teller and Wigner. The scientists persuaded the Army and Navy to provide $6,000 for Szilard to purchase supplies for experiments—in particular, more graphite. In April 1941, the National Defense Research Committee (NDRC) created a special project headed by Arthur Compton, a Nobel-Prize-winning physics professor at the University of Chicago, to report on the uranium program. Compton's report, submitted in May 1941, foresaw the prospects of developing radiological weapons, nuclear propulsion for ships, and nuclear weapons using uranium-235 or the recently discovered plutonium. In October he wrote another report on the practicality of an atomic bomb. For this report, he worked with Fermi on calculations of the critical mass of uranium-235. He also discussed the prospects for uranium enrichment with Harold Urey. The final draft of Compton's November 1941 report made no mention of plutonium, but after discussing the latest research with Ernest Lawrence, Compton became convinced that a plutonium bomb was also feasible. In December, Compton was placed in charge of the plutonium project. Its objectives were to produce reactors to convert uranium to plutonium, to find ways to chemically separate the plutonium from the uranium, and to design and build an atomic bomb. It fell to Compton to decide which of the different types of reactor designs the scientists should pursue, even though a successful reactor had not yet been built. He proposed a schedule to achieve a controlled nuclear chain reaction by January 1943, and to have an atomic bomb by January 1945.
where M is the average distance that a neutron travels before it is absorbed, and k is the average neutron multiplication factor. The neutrons in succeeding reactions will be amplified by a factor k, the second generation of fission events will produce k2, the third k3 and so on. In order for a self-sustaining nuclear chain reaction to occur, k must be at least 3 or 4 percent greater than 1. In other words, k must be greater than 1 without crossing the prompt critical threshold that would result in a rapid, exponential increase in the number of fission events. Before leaving for Chicago, Fermi's team made one last attempt to build a working pile at Columbia. Since the cans had absorbed neutrons, they were dispensed with. Instead, the uranium oxide, heated to 250 °C (480 °F) to dry it out, was pressed into cylindrical holes 3 inches (7.6 cm) long and 3 inches (7.6 cm) in diameter drilled into the graphite. The entire pile was then canned by soldering sheet metal around it, and the contents heated above the boiling point of water to remove moisture. The result was a k of 0.918. Though held secret for a decade, Fermi patented the design, with a initial filing date of Dec. 19, 1944 as the neutronic reactor no. 2,708,656. The Red Gate Woods later became the original site of Argonne National Laboratory, which replaced the Metallurgical Laboratory on 1 July 1946, with Zinn as its first director. CP-2 and CP-3 operated for ten years before they outlived their usefulness, and Zinn ordered them shut down on 15 May 1954. Their remaining usable fuel was transferred to Chicago Pile-5 at the Argonne National Laboratory's new site in DuPage County, and the CP-2 and CP-3 reactors were dismantled in 1955 and 1956. Some of the graphite blocks from CP-1/CP-2 were reused in the reflector of the TREAT reactor. High-level nuclear waste such as fuel and heavy water were shipped to Oak Ridge, Tennessee, for disposal. The rest was encased in concrete and buried in a 40-foot-deep (12 m) trench in what is now known as the Site A/Plot M Disposal Site. It is marked by a commemorative boulder. By the 1970s there was increased public concern about the levels of radioactivity at the site, which was used by the local residents for recreational purposes. Surveys conducted in the 1980s found strontium-90 in the soil at Plot M, trace amounts of tritium in nearby wells, and plutonium, technetium, caesium, and uranium in the area. In 1994, the United States Department of Energy and the Argonne National Laboratory yielded to public pressure and earmarked $24.7 million and $3.4 million respectively to rehabilitate the site. As part of the clean up, 500 cubic yards (380 m3) of radioactive waste was removed and sent to the Hanford Site for disposal. By 2002, the Illinois Department of Public Health had determined that the remaining materials posed no danger to public health. The successful test of CP-1 not only proved that a nuclear reactor was feasible, it demonstrated that the k factor was larger than originally thought. This removed the objections to the use of air or water as a coolant rather than expensive helium. It also meant that there was greater latitude in the choice of materials for coolant pipes and control mechanisms. Wigner now pressed ahead with his design for a water-cooled production reactor. There remained concerns about the ability of a graphite-moderated reactor being able to produce plutonium on industrial scale, and for this reason the Manhattan Project continued the development of heavy water production facilities. An air-cooled reactor, the X-10 Graphite Reactor, was built at the Clinton Engineer Works in Oak Ridge as part of a plutonium semiworks, followed by larger water-cooled production reactors at the Hanford Site in Washington state. Enough plutonium was produced for an atomic bomb by July 1945, and for two more in August. Today the site of the old Stagg Field is occupied by the University's Regenstein Library, which was opened in 1970, and the Joe and Rika Mansueto Library, which was opened in 2011. A Henry Moore sculpture, Nuclear Energy, stands in a small quadrangle just outside the Regenstein Library. It was dedicated on 2 December 1967, to commemorate the 25th anniversary of CP-1 going critical. The commemorative plaques from 1952, 1965 and 1967 are nearby. A graphite block from CP-1 can be seen at the Bradbury Science Museum in Los Alamos, New Mexico; another is on display at the Museum of Science and Industry in Chicago. On 2 December 2017, the 75th anniversary, the Massachusetts Institute of Technology in restoring a research-graphite pile, similar in design to Chicago Pile-1, ceremonially inserted the final uranium slugs. ^ a b c National Park Service (9 July 2010). "National Register Information System". National Register of Historic Places. National Park Service. ^ a b c d "Site of the First Self-Sustaining Nuclear Reaction". National Historic Landmark Summary Listing. National Park Service. Archived from the original on 5 April 2015. Retrieved 26 July 2013. ^ a b "Site of the First Self-Sustaining Controlled Nuclear Chain Reaction". City of Chicago. Retrieved 26 July 2013. ^ Fermi 1982, p. 24. ^ Ölander, Arne. "The Nobel Prize in Chemistry 1956 – Award Ceremony Speech". The Nobel Foundation. Retrieved 23 September 2015. ^ Rhodes 1986, pp. 13, 28. ^ Wellerstein, Alex (16 May 2014). "Szilard's chain reaction: visionary or crank?". Restricted Data. Retrieved 23 September 2015. ^ Szilard, Leo. "Improvements in or relating to the transmutation of chemical elements, British patent number: GB630726 (filed: 28 June 1934; published: 30 March 1936)". Retrieved 23 September 2015. ^ Rhodes 1986, pp. 251–254. ^ Hahn, O.; Strassmann, F. (1939). "Über den Nachweis und das Verhalten der bei der Bestrahlung des Urans mittels Neutronen entstehenden Erdalkalimetalle (On the detection and characteristics of the alkaline earth metals formed by irradiation of uranium with neutrons)". Die Naturwissenschaften. 27: 11–15. Bibcode:1939NW.....27...11H. doi:10.1007/BF01488241. ^ Rhodes 1986, pp. 256–263. ^ Rhodes 1986, pp. 267–271. ^ Brasch, A.; Lange, F.; Waly, A.; Banks, T. E.; Chalmers, T. A.; Szilard, Leo; Hopwood, F. L. (8 December 1934). "Liberation of Neutrons from Beryllium by X-Rays: Radioactivity Induced by Means of Electron Tubes". Nature. 134 (3397): 880. Bibcode:1934Natur.134..880B. doi:10.1038/134880a0. ISSN 0028-0836. ^ Lanouette & Silard 1992, pp. 172–173. ^ Anderson, H. L.; Booth, E. T.; Dunning, J. R.; Fermi, E.; Glasoe, G. N.; Slack, F. G. (1939). "The Fission of Uranium". Physical Review. 55 (5): 511–512. Bibcode:1939PhRv...55..511A. doi:10.1103/physrev.55.511.2. ^ Rhodes 1986, pp. 267–270. ^ Anderson, H. L.; Fermi, E.; Hanstein, H. (16 March 1939). "Production of Neutrons in Uranium Bombarded by Neutrons". Physical Review. 55 (8): 797–798. Bibcode:1939PhRv...55..797A. doi:10.1103/PhysRev.55.797.2. ^ Anderson, H.L. (April 1973). "Early Days of Chain Reaction". Bulletin of the Atomic Scientists. Educational Foundation for Nuclear Science, Inc.
^ Lanouette & Silard 1992, p. 227. ^ "Alfred O. C. Nier". American Physical Society. Retrieved 4 December 2016. ^ Bonolis 2001, pp. 347–352. ^ Amaldi 2001, pp. 153–156. ^ a b Lanouette & Silard 1992, pp. 194–195. ^ Anderson, H.; Fermi, E.; Szilárd, L. (1 August 1939). "Neutron Production and Absorption in Uranium". Physical Review. 56 (3): 284–286. Bibcode:1939PhRv...56..284A. doi:10.1103/PhysRev.56.284. ^ a b International Atomic Energy Agency. "Nuclear Data for Safeguards". www-nds.iaea.org. Retrieved 16 August 2016. ^ a b c Weinberg, Alvin (1994). "Herbert G. MacPherson". Memorial Tributes. National Academy of Engineering Press. 7 (7): 143–147. Bibcode:1993PhT....46g.103W. doi:10.1063/1.2808987. ISSN 1075-8844. ^ Bethe, Hans A. (2000). "The German Uranium Project". Physics Today. American Institute of Physics. 53 (7): 34–36. Bibcode:2000PhT....53g..34B. doi:10.1063/1.1292473. ^ Eatherly, W. P. (1981). "Nuclear graphite – the first years". Journal of Nuclear Materials. 100 (1–3): 55–63. Bibcode:1981JNuM..100...55E. doi:10.1016/0022-3115(81)90519-5. ^ Salvetti 2001, pp. 177–203. ^ Nightingale 1962, p. 4. ^ "Einstein's Letter to Franklin D. Roosevelt". Atomic Archive. Retrieved 20 December 2015. ^ "Pa, this requires action!". The Atomic Heritage Foundation. Archived from the original on 29 October 2012. Retrieved 26 May 2007. ^ Hewlett & Anderson 1962, pp. 36–38. ^ a b Hewlett & Anderson 1962, pp. 46–49. ^ a b Anderson 1975, p. 82. ^ Salvetti 2001, pp. 192–193. ^ a b Hewlett & Anderson 1962, pp. 54–55. ^ Hewlett & Anderson 1962, pp. 180–181. ^ a b c Weinberg 1994, p. 15. ^ a b Rhodes 1986, pp. 396–397. ^ Segrè 1970, p. 116. ^ Anderson 1975, p. 86. ^ Embrey 1970, p. 385. ^ Anderson 1975, pp. 86–87. ^ a b Rhodes 1986, pp. 399–400. ^ Anderson 1975, p. 88. ^ Rhodes 1986, pp. 400–401. ^ a b Rhodes 1986, p. 401. ^ Zug 2003, pp. 134–135. ^ Bearak, Barry (16 September 2011). "Where Football and Higher Education Mix". The New York Times. Retrieved 2 December 2015. ^ Libby 1979, p. 86. ^ Hewlett & Anderson 1962, pp. 74–75. ^ Rhodes 1986, pp. 427–428. ^ Rhodes 1986, p. 431. ^ a b Anderson 1975, p. 91. ^ Rhodes 1986, p. 429. ^ Libby 1979, p. 85. ^ Rhodes 1986, p. 430. ^ Hewlett & Anderson 1962, pp. 65–66, 83–88. ^ Jones 1985, pp. 67–68. ^ a b c d e "Red Gate Woods: 'Site A'". Forest Preserves of Cook County. Retrieved 26 November 2015. ^ Jones 1985, pp. 71–72, 111–114. ^ a b c d Compton 1956, pp. 136–137. ^ a b c d Hewlett & Anderson 1962, pp. 107–109. ^ a b c Compton 1956, pp. 137–138. ^ Groves 1962, p. 53. ^ Nichols 1987, pp. 66. ^ Salvetti 2001, p. 197. ^ a b c d e Rhodes 1986, p. 433. ^ Rhodes 1986, p. 436. ^ a b Anderson 1975, pp. 91–92. ^ a b c Holl, Hewlett & Harris 1997, p. 16. ^ "How the first chain reaction changed science". University of Chicago. Retrieved 22 November 2015. ^ "Chapter 1: Wartime Laboratory". ORNL Review. 25 (3 and 4). 2002. ISSN 0048-1262. Archived from the original on 25 August 2009. Retrieved 22 March 2016. ^ Libby 1979, p. 119. ^ Rhodes 1986, p. 434. ^ "Frontiers Research Highlights 1946–1996" (PDF). Argonne National Laboratory. 1996. p. 11. Retrieved 23 March 2013. ^ Walsh, J. (1981). "A Manhattan Project Postscript" (PDF). Science. 212 (4501): 1369–1371. Bibcode:1981Sci...212.1369W. doi:10.1126/science.212.4501.1369. PMID 17746246. ^ Anderson 1975, p. 93. ^ Fermi, Enrico (1952). "Experimental Production of a Divergent Chain Reaction". American Journal of Physics. 20 (9): 536–558. Bibcode:1952AmJPh..20..536F. doi:10.1119/1.1933322. ISSN 0002-9505. ^ Holl, Hewlett & Harris 1997, pp. 16–17. ^ Groves 1962, p. 54. ^ a b c d e "CP-1 Goes Critical". Department of Energy. Archived from the original on 22 November 2010. ^ a b c d Libby 1979, pp. 120–123. ^ Allardice & Trapnell 1982, p. 14. ^ "George Weil – from activator to activist" (PDF). New Scientist. 56 (822): 530–531. 30 November 1972. ISSN 0262-4079. Retrieved 25 March 2016. ^ Hewlett & Anderson 1962, p. 174. ^ Rhodes 1986, p. 440. ^ Anderson 1975, p. 95. ^ "Argonne's Nuclear Science and Technology Legacy: The Italian Navigator Lands". Argonne National Laboratory. 10 July 2012. Retrieved 26 July 2013. ^ Manhattan District 1947, p. 3.9. ^ Holl, Hewlett & Harris 1997, p. 23. ^ "Reactors Designed by Argonne National Laboratory: Chicago Pile 1". Argonne National Laboratory. 21 May 2013. Retrieved 26 July 2013. ^ "Atoms Forge a Scientific Revolution". Argonne National Laboratory. 10 July 2012. Retrieved 26 July 2013. ^ Manhattan District 1947, p. 3.13. ^ a b Holl, Hewlett & Harris 1997, p. 428. ^ a b Fermi, Enrico (1946). "The Development of the first chain reaction pile". Proceedings of the American Philosophical Society. 90 (1): 20–24. JSTOR 3301034. ^ McNear, Claire (5 March 2009). "The Way Things Work: Nuclear waste". The Chicago Maroon. Retrieved 28 November 2015. ^ Wattenberg 1975, p. 123. ^ Holl, Hewlett & Harris 1997, p. 47. ^ Jones 1985, pp. 191–192. ^ Jones 1985, pp. 204–205. ^ Jones 1985, pp. 210–212. ^ Jones 1985, pp. 222–223. 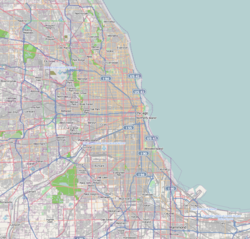 ^ "U. of C. to Raze Stagg Field's Atomic Cradle". Chicago Tribune. 26 July 1957. Retrieved 28 November 2015. ^ a b Site of the Fermi's "Atomic Pile" – First Nuclear Reactor. YouTube. Retrieved 28 November 2015. ^ "Remove Nuclear Site Plaque". Chicago Tribune. 16 August 1957. Retrieved 28 November 2015. ^ "Stagg Field / Mansueto Library". University of Chicago. Retrieved 28 November 2015. ^ "First-Hand Recollections of the First Self-Sustaining Chain Reaction". Department of Energy. Retrieved 23 September 2015. ^ "Milestone for new LEU research reactor fuel". World Nuclear News. 22 December 2017. Retrieved 29 December 2017. Allardice, Corbin; Trapnell, Edward R. (December 1982). "The First Pile". The First Reactor (PDF). Oak Ridge, Tennessee: United States Atomic Energy Commission, Division of Technical Information. pp. 1–21. OCLC 22115. Retrieved 27 May 2017. Anderson, Herbert L. (1975). "Assisting Fermi". In Wilson, Jane (ed.). All In Our Time: The Reminiscences of Twelve Nuclear Pioneers. Chicago: Bulletin of the Atomic Scientists. pp. 66–104. OCLC 1982052. Fermi, Enrico (December 1982). "Fermi's Own Story". The First Reactor (PDF). Oak Ridge, Tennessee: United States Atomic Energy Commission, Division of Technical Information. pp. 22–26. OCLC 22115. Retrieved 27 May 2017. Groves, Leslie (1962). Now It Can Be Told: The Story of the Manhattan Project. New York: Harper. ISBN 978-0-306-70738-4. OCLC 537684. Lanouette, William; Silard, Bela (1992). Genius in the Shadows: A Biography of Leo Szilard: The Man Behind The Bomb. New York: Skyhorse Publishing. ISBN 978-1-62636-023-5. OCLC 25508555. Libby, Leona Marshall (1979). The Uranium People. New York: Crane, Russak. ISBN 978-0-8448-1300-4. OCLC 4665032. Nichols, Kenneth D. (1987). The Road to Trinity: A Personal Account of How America's Nuclear Policies Were Made. New York: William Morrow and Company. ISBN 978-0-688-06910-0. OCLC 15223648. Nightingale, R.E. (1962). "Graphite in the Nuclear Industry". In Nightingale, R.E. (ed.). Nuclear Graphite. Academic Press. ISBN 978-1-4832-5848-5. OCLC 747492. Rhodes, Richard (1986). The Making of the Atomic Bomb. London: Simon & Schuster. ISBN 978-0-671-44133-3. Wattenberg, Albert (1975). "Present at Creation". In Wilson, Jane (ed.). All In Our Time: The Reminiscences of Twelve Nuclear Pioneers. Chicago: Bulletin of the Atomic Scientists. pp. 105–123. OCLC 1982052. Weinberg, Alvin (1994). The First Nuclear Era: The Life and Times of a Technological Fixer. New York: AIP Press. ISBN 978-1-56396-358-2.